A dense, upright shrub with leathery, dark green spiny leaves. New growth is bronze to copper colored. Showy yellow flowers in late fall through winter. Waxy blue colored berries develop over summer. 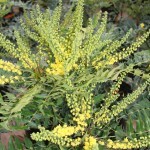 It prefers full sun to partial shade and an organically rich, well-drained soil. This makes a very bold addition to the landscape.